Educational requirements for doctors of chiropractic are among the most stringent of any of the health care professions. The typical applicant at a chiropractic college has already acquired nearly four years of pre-medical undergraduate college education, including courses in biology, inorganic and organic chemistry, physics, psychology and related lab work. 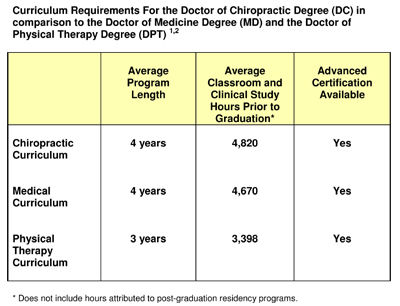 Once accepted into an accredited chiropractic college, the requirements become even more demanding -- four to five academic years of professional study are the standard. Because of the hands-on nature of chiropractic, and the intricate adjusting techniques, a significant portion of time is spent in clinical training. Doctors of Chiropractic - who are licensed to practice in all 50 states, the District of Columbia, and in many nations around the world - undergo a rigorous education in the healing sciences, similar to that of medical doctors. In some areas, such as anatomy, physiology, and rehabilitation, they receive more intensive education than most medical doctors or physical therapists. Before they are allowed to practice, doctors of chiropractic must pass national board examinations and become state-licensed. Chiropractic colleges also offer post-graduate continuing education programs in specialty fields ranging from sports injuries and occupational health to orthopedics and neurology. These programs allow chiropractors to specialize in a healthcare discipline or meet state re-licensure requirements. 1- Meeker W, Haldeman H. Chiropractic: A Profession at the Crossroads of Mainstream and Alternative Medicine. Annals of Internal Medicine 2002, Vol 136, No 3. 2- American Physical Therapy Association. 2005-2006 Fact Sheet, Physical Therapist Education Programs. January 2007.